Acquiring balcony glazing is an investment for the housing company that brings many benefits to the future. A glazed balcony brings joy to the homeowner, protects the balcony structures and increases the value of the apartments. It is advisable for a housing company to purchase balcony glazing at one time for the entire house. Balcony glazing increases the usability of the balconies of the apartment complex considerably. 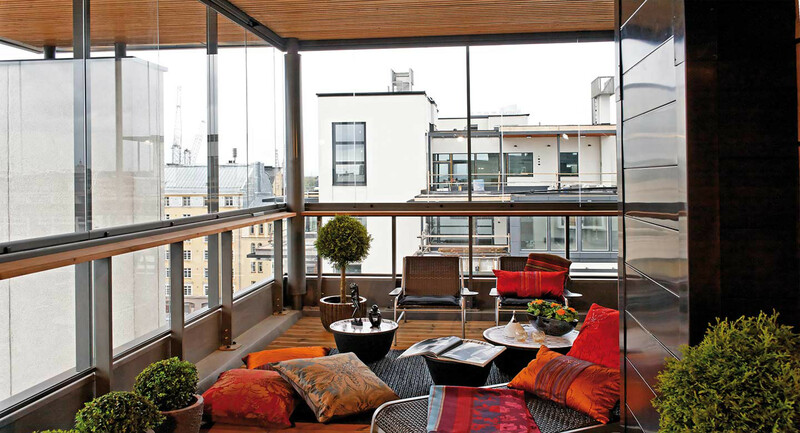 Glasses protect both the balcony and the furniture from weather variations. Also the balcony structures are protected. The use of the balcony is no longer limited to beautiful summer days. The glazed balcony raises the value of the apartment. The whole facade of the house can also be found thanks to the balcony glazing with a modern and modern look. The glazed balcony saves the heating energy. The balcony glazed to the condominium brings clear financial benefits. Regular maintenance and warranty policy of the balcony glazing of the housing company ensures that the glazing remains intact, safe and beautiful throughout their life. Lumon guarantees five-year service safety for replacement and original components and system functionality for its glazing systems. It is easy to get the balcony glazing at the same time for the entire condominium. A carefully thought-out process is easy for the customer, and the installation is successful all year round. Lumon's experts will be happy to present the possibilities that exist for you of balcony glazing in your condominium. We will tell you how the glazing project is progressing and what the residents of the housing company should consider when considering the reform. In addition, we bring with you a selection of different glazing options and answer your questions. Balcony glazing also protects the balcony structures by doubling the service intervals of the balconies. The non-glazed balcony requires a larger refurbishment every 10 years, while a regularly maintained glazed balcony moves the repair to 20 years. The resulting benefits for balcony structures are due to lower humidity, higher temperature and protection from water and rain on the balcony. So clearly save on property costs and start planning with a professional! Balcony glazing is easy to acquire at the same time for the entire condominium. The procurement process is easy for the customer and the installation is successful all year round. The appearance of the whole house is ensured by a well-kept and modern look thanks to the balcony glazing. Older property rejuvenates in the eyes. The old balcony façade can be refurbished to match the style of the building by upgrading the balcony railings and integrating the balcony glazing. The size of the balcony remains the same, but the coloring of the railings, the new surface materials and details give a new look, however, so that the reform merges into a common entity. Our standard solutions are tailored to individual balcony solutions and real estate in different periods. Check out the renovation projects that have already been implemented in our gallery. Balcony glazing increases the value of housing in the apartment complex, but also increases the comfort of housing all year round. The glazed balcony is home to every resident of the house from the first sunshine of spring until the autumn. The winter-glazed balcony also serves as a convenient storage space. Balcony glazing also brings more security to the lower floors: the movable furniture left on the balcony is safe from vandalism. The glazed balcony also protects against noise by isolating sound from up to 6-29dB. The noise produced by mopeds, cars, construction sites and other distractions is reduced by glazing. By glazing the balcony glazing, the residents of your house can enjoy a more peaceful balcony. More comfort is also available with sun shades that protect the sun and keep the neighbors' curious eyes away. Sun protection curtains also have an effect on energy savings. Contact us and ask our experts for more sun shades for the entire condominium. With Lumon, product development, design, sales, manufacturing and installation are all under the same roof, and over one million satisfied customers worldwide. Lumon's balcony glasses are a reliable and high quality choice, our end-of-life products have been made to meet the demands of modern construction. Glazed by a professional is safe and reliable. Regular maintenance of glazing significantly increases the life of glazing. The service life of the balcony glass is up to 30 years. We want to respond to our products throughout its lifecycle and that is why we have developed a quality service for our products. When servicing the whole house unit glazing at once, the housing company gets a considerable cost advantage. Lumon's experts will be happy to present the possibilities of balcony glazing to your condominium. For example, the presentation can be held at the Annual General Meeting. We will tell you how the glazing project is progressing and what the residents of the housing company should consider when considering the investment. In addition, we bring with you a selection of different glazing options and answer questions.